Twenty years ago, Kimberly-Clark, the Kleenex company, introduced a line of toilet paper embossed with the kite-and-dart aperiodic tiling discovered by Roger Penrose. When I first heard about this, I thought: How clever. Because the pattern never repeats, the creases in successive layers of a roll would never line up over any extended region, and so the sheets would be less likely to stick together. So often we read of very large companies riding roughshod over small businesses or individuals, but when it comes to the population of Great Britain being invited by a multinational [company] to wipe their bottoms on what appears to be the work of a knight of the realm without his permission, then a last stand must be made. Sir Roger sued. I haven’t been able to find a documented account of how the legal action was resolved, but it seems Kimberly-Clark quickly withdrew the product. Some years ago I was given a small sample of the infamous Penrose toilet paper. It came to me from Phil and Phylis Morrison; a note from Phylis indicates that they acquired it from Marion Walter. Now I would like to pass this treasure on to a new custodian. The specimen is unused though not pristine, roughly a foot long, and accompanied by a photocopy of the abovementioned Times news item. In the photograph below I have boosted the contrast to make the raised ridges more visible; in real life the pattern is subtle. Are you interested in artifacts with unusual symmetries? Would you like to add this object to your collection? Send a note with a U.S. mailing address to brian@bit-player.org. If I get multiple requests, I’ll figure out some Solomonic procedure for choosing the recipient(s). If there are no takers, I guess I’ll use it for its intended purpose. I must also note that my hypothesis about the special non-nesting property of the embossed paper is totally bogus. In the first place, a roll of toilet paper is an Archimedian spiral, so that the circumference increases from one layer to the next; even a perfectly regular pattern will come into coincidence with itself only when the circumference equals an integer multiple of the pattern period. 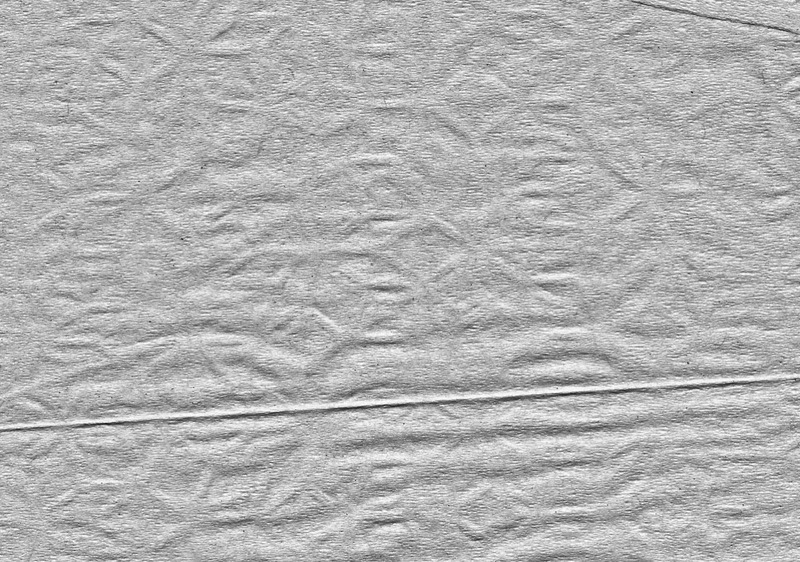 Second, the texture imprinted on the toilet paper is surely not a real aperiodic tiling. The manufacturing process would have involved passing the sheet between a pair of steel crimping cylinders bearing the incised network of kites and darts. Those cylinders are necessarily of finite diameter, and so the pattern must in fact repeat. If Kimberly-Clark had contested the law suit, they might have used that point in their defense. This entry was posted in mathematics, off-topic, uncategorized.